Hard Rock says some staff remain loyal "for years"
Staff at one of the UK's best-known restaurants are getting paid £2.06 an hour - less than half the national minimum wage, the BBC has found. 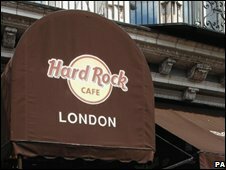 The Hard Rock Cafe in London relies on tips from customers to lift earnings to the legal level of £5.52. One waiter, who wished to remain anonymous, accused the management of being "downright greedy". A spokeswoman for Hard Rock defended its actions, saying it was doing nothing illegal. "It's an abuse of customers - they are being misled in that they believe they are giving a tip when they are subsidising the actual wage," the unnamed waiter said. "They are manipulating their employees and customers and playing one off against the other." The wage of £2.06 an hour is even lower than the £3.75 an hour paid by the Carluccio's restaurant chain, which was revealed by the BBC in April. "It's almost insulting, no wonder people leave," said the waiter. However, a spokeswoman for the firm said it was "free to distribute the service charge as it sees fit". She added that unlike some competitors, Hard Rock ensured staff kept 100% of cash and credit card tips. "With the addition of the service charge, staff in London can earn between £8 and £12 an hour, depending on the level of business." She claimed many staff remained with the company "for years". The Department for Business is reviewing the rules which allow restaurants to include tips in the calculations for the minimum wage. It has come under pressure from the union Unite, which has launched a campaign to stop companies retaining staff tips. Hard Rock describes itself as a "philanthropic" company, and has an official motto of "Love All Serve All". Last month, it sponsored high-profile concerts in Hyde Park starring Eric Clapton and the Police.